On the night of July 10th, 2009, Dreams came true. 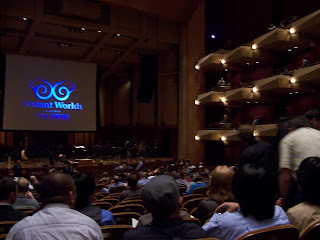 At the Benaroya Hall in Seattle, WA the Seattle Symphony decided to hold a Distant Worlds concert. For those of you that don't know what Distant Worlds is, it's a concert performed by professional orchestras across the globe playing various pieces from the Final Fantasy series. They have gone to many places already including Singapore, Stockholm, Taipei and the upcoming San Francisco performance which is on July 18th, 2009 at the Davies Symphony Hall. For those of you who know me or have read my first blog on here know what a big Final Fantasy fan I am. 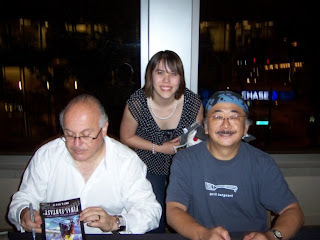 I have also mentioned in my first blog about how Nobuo Uematsu, the composer of Final Fantasy, is my hero and I would love to meet him. Well, the chance came by after reading news of Nobuo Uematsu will be attending the Distant Worlds concert in Seattle. It was 2 weeks before the concert and I instantly needed to go. A good friend and I figured out our money, got gas, and on Friday started driving to the city. When we finally got to Seattle we parked the car and headed in to the big Benaroya Hall. As I walked in, people were everywhere in semi-formal clothing and the occasional someone with a moogle hat or an FF plushie of some sort. Final Fantasy was in the air and I was on cloud nine. The doors open and we went in to take our seats. The inside was 3 levels high (I was on the orchestra floor) and the room was instantly packed. Made me even more thankful I was able to get tickets in time. As we waited I could hear the orchestra tuning their instruments and getting prepared. Hearing glimpses of Aerith's Theme and To Zanarkand already had me at the edge of my seat. As the concert started, Nobuo Uematsu himself walked out on to the stage and bowed to the audience. Everyone stood and cheered in praise of him. I was taken back, I wasn't expecting to see him right away! After that pleasant surprise the conductor, Arnie Roth, came out to get things started. The spotlight was on the Choral and the Final Fantasy VIII logo flashed across the screen. A huge smile grew across my face for they were singing/playing Liberi Fatali. Images from the game played with Squall Leonhart and Seifer Almasy fighting added with scenes of Rinoa Heartilly and the antagonist Sorceress Edea. A great way to start off the concert! After, Roth said his welcomes and told us what we were in for tonight. The next song they played was To Zanarkand from Final Fantasy X. I have to say, this was probably the most beautiful version I have heard of this piece. Although I like this piece a lot and have always found it hauntingly beautiful it didn't really stand out to me. But this performance totally changed my view. I was literally brought to tears on this one. Scenes of Tidus and Yuna was just absolutely wonderful. The screen cleared and then we saw FFVIII game play! The whole crowd chuckled for we knew it was random battle time. Don't Be Afraid was epic! There was so much power behind it. I definitely felt the energy from the performance. What came afterwards is something very dear to my heart, Aerith's Theme. First, Aerith Gainsborough happens to be my favorite video game character ever so to hear her theme performed by a professional orchestra live is absolutely breathtaking. Combine that with scenes with Aerith and you have a moved Chibi Ma. Are you ready to get old school? Medley I-III was awesome! It had it all, town songs, battle, chocobo themes, etc. Definitely can bring up anyone's mood. For Final Fantasy V, you had acoustic with a mix of Amano art. Very well done! I do wish they showed some FFV game play but in the end, lovely. Vamo alla Flamenco was fun and lively! Good pick from Final Fantasy IX. FFIX also is my favorite Final Fantasy so I wish they had other song picks but this works. Here's my favorite from the concert, Love Grows from Final Fantasy VIII. I'm a total hopeless romantic and a big fan of Squall and Rinoa so to hear the main love theme made a very content moogle here. Okay, not a big fan of Final Fantasy XI but great song none the less! Ronfaure gave you the big adventure feeling as it should! To end part one, they played the Final Fantasy Main Theme. Need I say more? This song is a staple to a FF concert. To not have it would be outrageous. Off into part 2 they had to make a few changes unfortunately. They went straight into FFVII: Opening-Bombing Mission, good pick to open the second half! Fisherman's Horizon from FFVIII afterwards was wonderful as always. Another FFXI, Memoro de la Stono was big, deep, and just enjoyable. The Man with the Machine Gun from FFVIII was great and Swing de Chocobo was hilarious. Now here’s the sad part for me, they had to cut out Theme of Love from FFIV. This song happens to be one of my most favorite FF songs so i was disappointed to not hear it. Opera-Maria and Draco from FFVI was gorgeous. It was sung by Angela Niederloh, Stephen Rumph and Michael Delos. To finish off the concert was Terra's Theme from FFVI. Another favorite, done wonderfully! As the credits for the concert played the crowd cheered and clapped (especially for Tetsuya Nomura, Yoshitaka Amano and of course Nobuo Uematsu). In conclusion, this concert was something to remember. Listening and watching made me realize how Uematsu's work has brought so many different kinds of people together. That not only gamers but others outside are starting to appreciate it for it is. These masterpieces need to be known and acknowledge and it was!! The Meet and Greet with Nobuo Uematsu at the end was what really meant something to me. Nobuo has been a hero of mine since I was 13 years old. His music has inspired me, motivated me, and is the reason why I know the piano today. I never thought I would ever get to meet him. Yet there I was shaking his hand. Nobuo Uematsu is so nice and polite. He's down to earth and treats his fans so well. I am so thankful I got to meet him. Something I will remember for the rest of my life. Overall, I HIGHLY recommend this concert, fantastic music, spirited audience, and a legend to meet and memories to share. This is a chance that shouldn't be missed.